At the end of 2018, I was feeling so burned out and tired. I absolutely love my job and I feel so grateful daily that I work for myself! However, the combination of me working from home and Aaron working 90+ hours a week away from home had led me into a habit of just working, working, working all the time. By December, I had done 50% more work than the previous year, and I could not figure out what to do with myself when I wasn’t working. I took a couple of weeks off between Christmas and New Years and realized how much I needed to reset. I couldn’t stand the thought of going back to work after my holiday, and that is not the way I want to feel towards the job that is also my greatest passion! So I decided that it was time to invest more in other interests/hobbies again. I wanted a focus outside of my work and a couple of dedicated activities I could spend time on to intentionally draw me away from my bad work habits! My two other favorite things are fashion and baking, so I started a new ‘lifestyle’ Instagram account to document those things. I found it so refreshing and enjoyable to be on social media just for fun, with no pressure to talk about my products or appear professional before my audience. 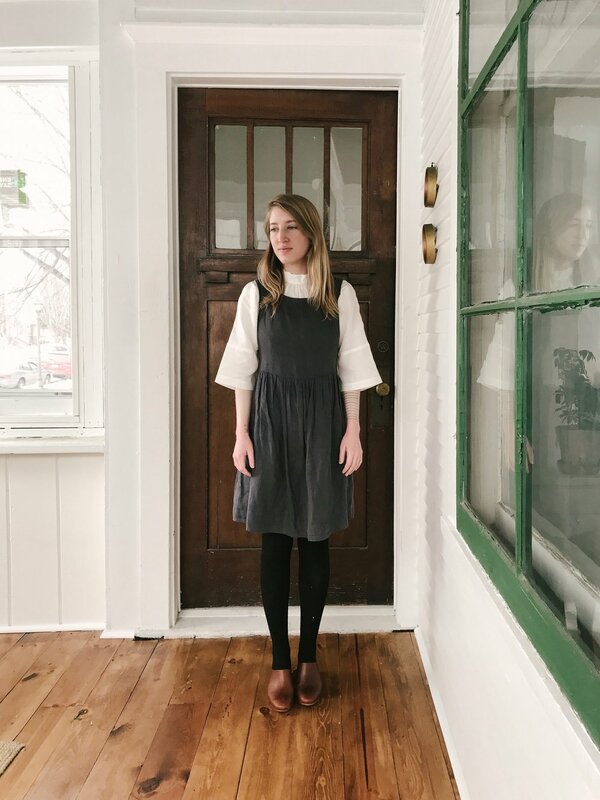 I had already been really into slow fashion since I started my journey a few years back, but actively engaging with others who share the same interest and discovering new brands drew me in even more! I found myself waking with more energy and looking forward to picking out outfits to play around with and share. I was so encouraged every time a follower reached out to me for sizing, fabric, or color advice because it felt like I was able to play a tiny part in helping others explore the very same passion that I have been. I also started blogging again - very casually, and just because I enjoyed it. When I first settled on the idea of starting my own business, I originally thought that lifestyle blogging was the way I wanted to go because I love writing, photography, and reading other peoples’ blogs! I changed direction pretty quickly because drawing and painting has always been my absolute favorite thing, but I still really loved writing those few blog posts early on in our marriage. I wanted to return to that to share more about my favorite brands, our home, and new recipes I tried. However, over the last few months, I’ve also really struggled with feelings of self-consciousness and doubt, and that’s mostly what I want to talk about today. My fears were - as they so often are - rooted in what other people would think of me. I worried that the people following my business would feel like I was stepping out of my lane and (in some cases) into theirs. I worried that people would wonder why I was trying to start this other thing since I’m already pursuing my passion for art through my job. Why would I need to explore another avenue? Would people think that I was prideful or full of myself because I was posting so many photos of my outfits? Would my friends and acquaintances worry that I was becoming shallow and vacuous? I worried that I looked foolish. I worried that I would appear un-original and uncreative. I wanted to share my thoughts and perspective on slow fashion and on different brands I tried, but I was afraid that I wouldn’t be saying anything different or adding any value to what’s already being said. I worried that people would find my outfit posts annoying. I worried about what people would think of my blog - everyone has a blog these days, and I was afraid that people would roll their eyes and think I thought too much of myself when I started sharing my ideas and experiences in that way. I’ve also struggled with where to take this interest of mine. I started investing more in fashion for fun with the intention of it being a low-stress, enjoyable distraction from the hectic pace of the rest of my life. On the other hand, ethical and sustainable clothing isn’t cheap and we live on a very average income. I started feeling guilty about spending our money on my clothes and taking what could be put towards savings (or something for Aaron) and using it on myself, instead. I am always very intentional about my purchases, but there’s no doubt that my shopping has increased since I started to focus more on fashion. Now that I follow more brands, I see more beautiful new pieces every day, which is highly tempting! I also feel pressure to not repeat my outfits as often since I don’t want my posts to be redundant, which makes shopping for new and fun pieces more appealing. I started wondering if I should try to make something more out of my Instagram account or my blog - maybe I should start using hashtags to increase my following and seem more ‘legitimate,’ with the end goal of being able to receive gifted items from brands. Then I wouldn’t have to spend as much of our money on this hobby of mine. Or, if it became something more than a hobby, it would be easier to justify spending the money. What it all comes down to, though, is that I started my account and sporadic blogging for fun - as a way to de-stress, not to add more complication to our already crazy lives. I started it because I wanted to do something that I enjoy, and that’s how I want to continue. I don’t want to be swimming in my own fears about what other people think of me or let that rule my actions. I don’t want to let anxiety about the opinion of others take away the joy and excitement I felt about investing in a passion. There is an attitude in our country these days that encourages people to monetize their passions. It’s almost like there is an expectation that when someone has a hobby, the next step will be to turn it into some sort of business or side-hustle. I’ve heard this talked about more and more lately, and it’s really gotten me thinking. I think it’s wonderful that people are able to pursue their passions and work for themselves (as I have done), but I also don’t think we should all have that as an expectation. I think I have been feeling that pressure to monetize my interest in slow fashion, but there is no need, and I don’t want that to take the fun out of what I’m doing. I also think it’s really important to note that - because ethical/sustainable fashion often has such a high price point - it often seems unattainable for the average person. So many style bloggers/Instagrammers receive gifted items or do sponsored content, and that is a big part of the reason that they have the wardrobes they do. And don’t get me wrong - I don’t have any problem with people accepting ads, gifts, or sponsored items in moderation! I know that’s a part of many peoples’ business models which also benefits clothing companies. However, I have always wanted my slow fashion journey to be very relatable, and in order to keep it that way I need to purchase the majority of my wardrobe myself. So far, I have accepted two gifted items, both from the same wonderful small company. Everything else I own has been either purchased by me or given to me by a family member. I’m proud of the fact that I can speak from a place of experience when it comes to shopping ethically on a budget, because that’s how my whole wardrobe has been built and that’s how it will continue to be built.